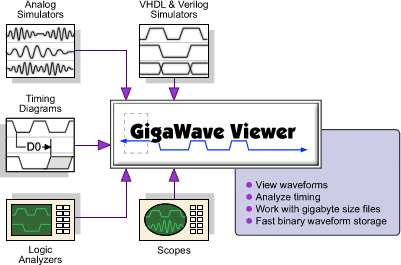 Gigawave Viewer combines SynaptiCAD's free VCD WaveViewer with our high-performance gigawave compression engine to create the lowest cost waveform viewer capable of handling multi-gigabyte VCD files. Gigawave viewer also comes with a PLI-based library that can be integrated with your favorite simulator to generate highly compressed BTIM files. Using BTIM waveform dumping can speed up simulation by up to 6x over dumping using an ordinary VCD dump and the resulting files are generally 200x smaller. BTIM files also load much faster than VCD files (typically around 500x faster)! GigaWave also loads SPICE results, TDML, logic analyzer data, and more.